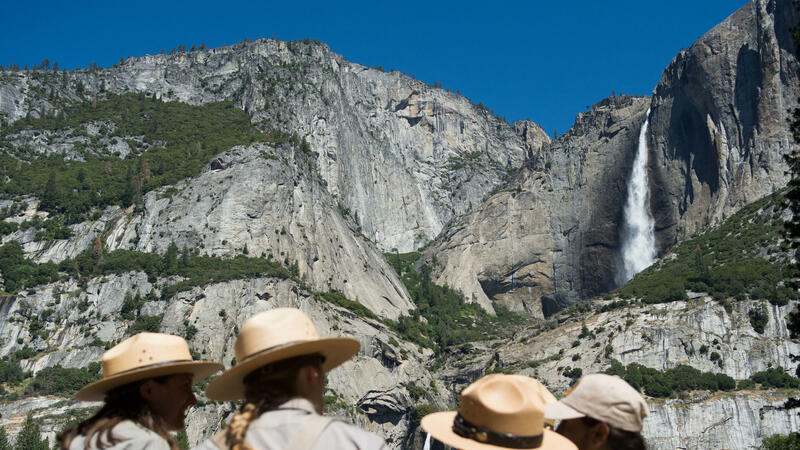 Park rangers meet in front of Yosemite Falls in 2016 in Yosemite National Park in California. Increased fees are expected to boost funding for park maintenance across the country. The original proposal, which called for nearly tripling entrance fees to 17 of the most popular parks during their peak season, generated more than 100,000 public comments. "I want to thank the American people who made their voices heard through the public comment process on the original fee proposal," Interior Secretary Ryan Zinke said in a statement. "Your input has helped us develop a balanced plan that focuses on modest increases at the 117 fee-charging parks as opposed to larger increases proposed for 17 highly visited national parks." Entrance fees for vehicles will increase by $5 at the fee-charging parks, starting in June. Park-specific annual passes will also cost more, though the price will vary from park to park. The price for the annual "America the Beautiful" pass, which allows access to most parks, and the Lifetime Senior Pass will continue to be $80. More than two-thirds of national parks, historic sites and monuments will remain free to enter, the National Park Service says. Here's a complete list of the fee increases. The National Park Service has said it needs to increase entrance fees to its parks to help cover the cost of $11.6 billion in deferred maintenance in the nation's park system — a backlog that ranges from crumbling roadways and campgrounds to aging sewage systems. The Interior Department's original proposal was projected to raise $70 million a year. Officials hoped to capitalize on record visitor numbers to hugely popular national parks like Zion, Yosemite, Yellowstone and Glacier. The park service estimates that the new plan, once fully implemented, will increase annual entrance fee revenue by $60 million. Entrance fees reached $199 million in fiscal 2016, according to the agency. Most of that money stays in the park where it's collected. "Fees do have a role to play in our parks," Theresa Pierno, the president and CEO of the nonprofit advocacy group the National Parks Conservation Association, said in a statement. "[T]he administration's move to abandon its original proposal in favor of more measured fee increases will put additional funds into enhancing park experiences without threatening visitation or local economies." The NPCA opposed the larger fee increase when it was first proposed. Pierno and Zinke both stated that the fee increase alone is not enough to address the park system's maintenance backlog. Zinke is pushing Congress to pass bipartisan legislation that would use revenue from new energy development on federal land and water to address park maintenance. Zinke says the proposal could generate $18 billion for the park service over 10 years. Pierno and the NPCA are calling on Congress to increase funding to the nation's parks.